The Xam River, after crashing through the steep canyons of the virgin jungle of the Nam Xam Nature Reserve in western Houaphon, Laos, finally emerges into the exquisite Xam Tai valley, where it meanders lazily for several miles before tumbling again downhill, across Vietnam, to the Gulf of Tonkin. The town of Xam Tai nestles the river in this valley, sitting luxuriously amid the green rice fields, a haven from a crowded and noisy world (although I will note that the Vietnam War years were a bit noisier…). 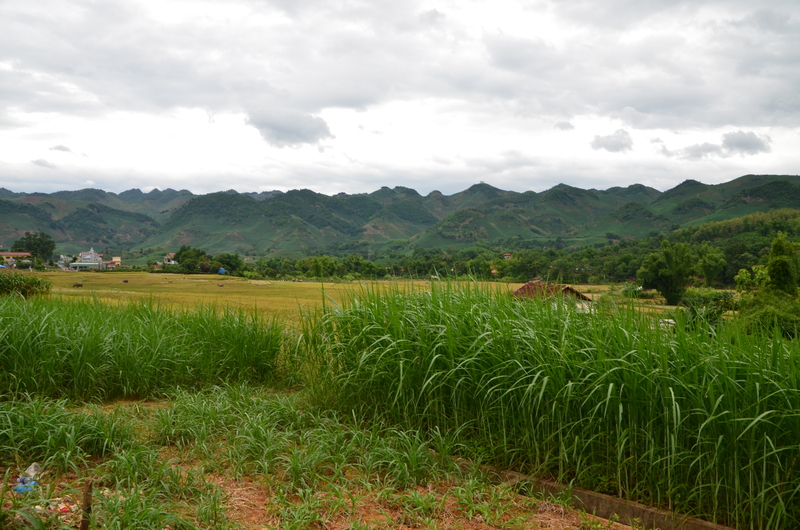 The valley widens to reveal lush rice fields and the wonderful village of Xam Tai. 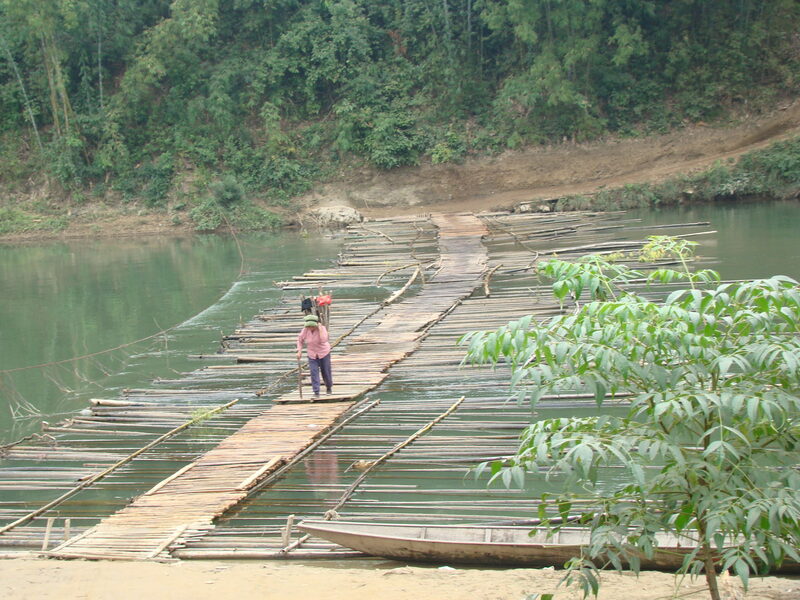 To go beyond Xam Tai requires crossing the river. 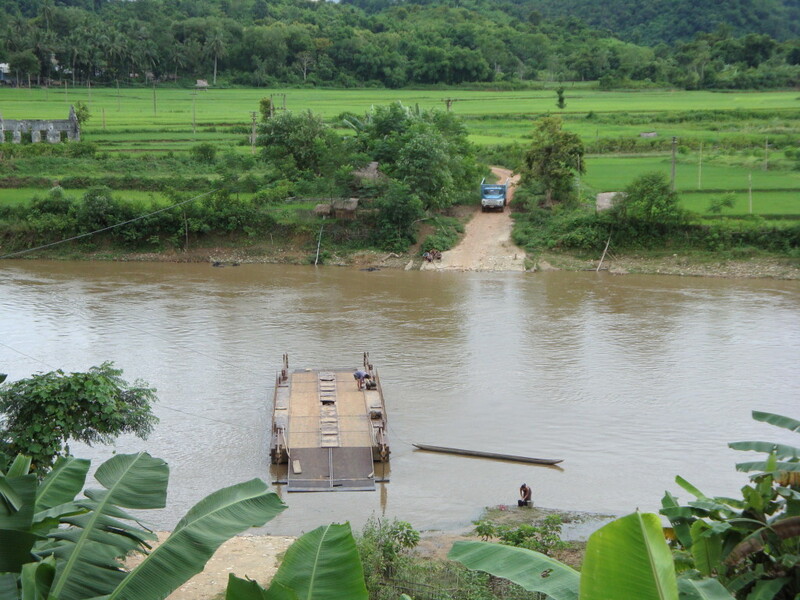 Perhaps twice a day, an ancient rusted barge will hand-cranked across the river using a pulley/cable system; it will lug any 4 or more wheeled vehicles across the small river (slowwww-ly) so they may continue on a single lane dirt road to Ban Tao and other small villages. 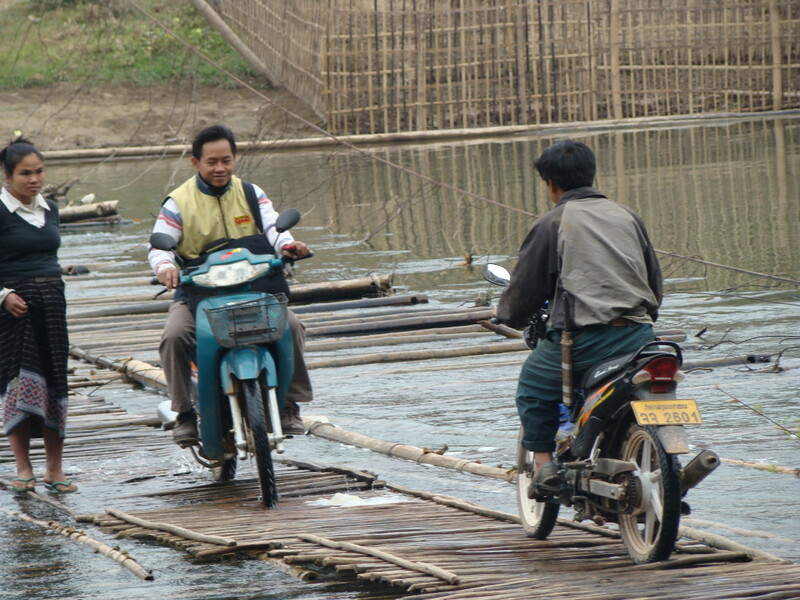 Luckily, most people are on foot or motorcycle and can avoid the cost of the ferry by crossing right in town, next to the kid’s swimming hole, on … well … on a floating bridge. 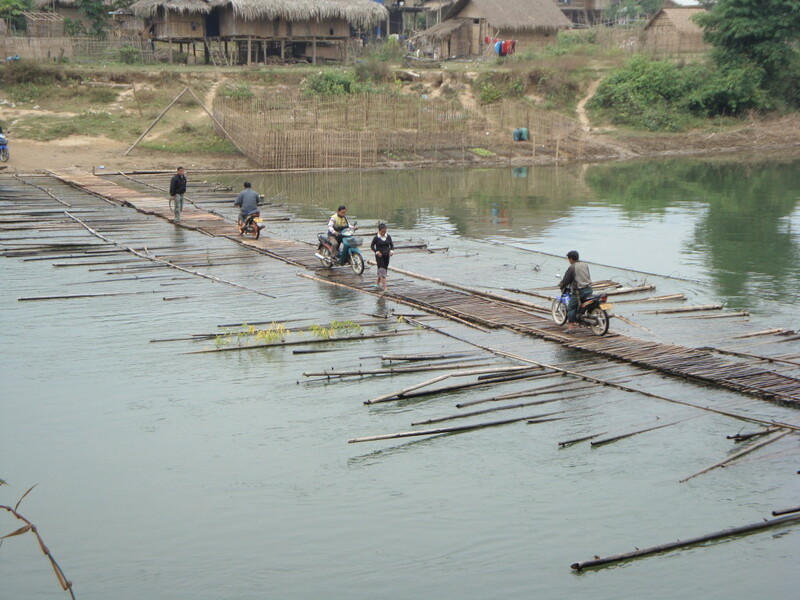 The hand-powered crossing the Xam River. It’s the only way to get anything with 4 or more wheels across the river. A truck on the opposite side will wait until there is another vehicle or two to split the cost of a crossing. The concept is simple – strap together this strong, hollow, freely available, rot-proof plant – bamboo – and just walk across it. We were dubious at first – being a little “heavier-set” than the locals. 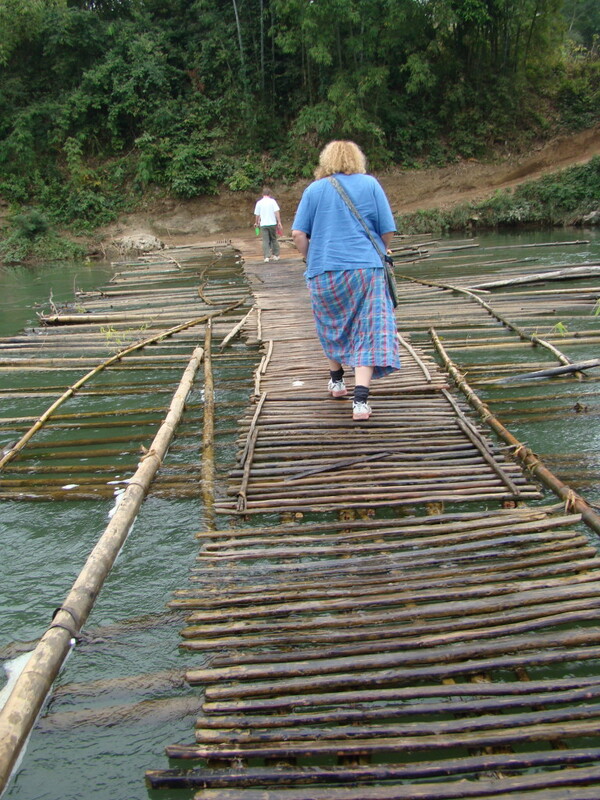 And the bamboo platform did sink a bit, with water splashing an inch up the sides of our shoes. “Walk faster,” crooned Zall. Sure enough, a good pace assured nothing sank too deeply into the cool wet. The same rule of physics works for motorcycles. Once we had tippy-toed across, here come two motorcycles, one from either side, who gunned their motors in a rush to dash across. Stopping would have been an assured soaking, so each driver focused on maintaining appropriate momentum and balance until reaching terra firma. I could not exhale until each was safe. Another motorcycle zipped across, water rooster-tailing from the rear wheel. He wove around a woman carrying a backpack basket full of firewood; the bamboo planks splashed and rolled a bit. We sat at that viewpoint for an hour watching the local traffic use this essential link. And no, despite our anxiousness with every crossing, no one got wetter than a splashed ankle. “It looks just like something you’d only find in Laos,” Zall commented. And we all nodded.